Besides plain almonds, we are also involved in offering high-quality Salted Almonds to our clients. These almonds are highly acclaimed for their unique taste. 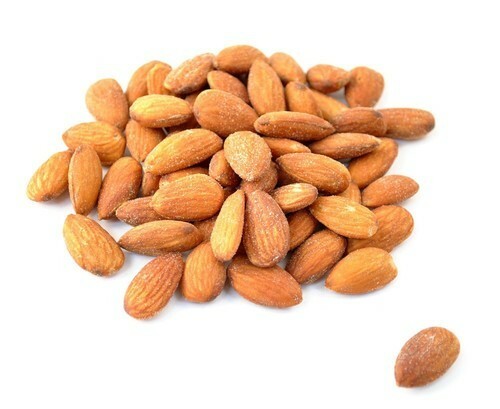 Rich sources of dietary fibre, these almonds are supplied to clients in different packaging sizes at reasonable prices. These are packaged hygienically in air-tight packaging of multiple sizes. We supply these to clients within the specified time period at economical prices. The packaging sizes can differ as per the client’s expectations. Headquartered in Navi Mumbai, Maharashtra, we, Shah Premchand Keshavji and Co., are amongst the leading Wholesaler, Exporter, Importer and Supplier of superior-quality Indian Spices, Food Grains, Dry Fruits, Indian Flours, Glucose and Cream Biscuits, Chocolates and Candies, Incense Sticks, Peas and Beans. We offer a vast range of grocery products to our valuable clients under one roof. Our range of products includes Indian Spices, Biscuits, Dry Fruits, Food Grains, Indian Flours and Delicious Chocolates etc. These products guarantee optimum freshness and quality. These are free of foreign particles, adulterants and other impurities. Our brand Prisha is synonymous with purity and excellent quality. The demand for these products is always high in the market. These can be stored for long time periods owing to their long shelf life. We supply products to clients in different capacities as per their demands.